W￼ine lists at Italian restaurants used to be simple affairs: some Chianti, a little Montelpuciano, perhaps a selection of Barolo and Barbaresco—that is, if there was any Italian wine on the list at all. But things aren’t so simple anymore. “Our list has been challenging from the beginning,” says Dana Frank, wine director of Ava Gene’s in Portland, Oregon, about the labels that make it onto the restaurant’s 375-bottle, all-Italian wine list. But by shifting the focus away from the simple and obvious picks, Frank notes the aim is to excite guests, not challenge them. Frank wants to transmit the experience of Italy through her hyper-focused list, not just the familiar regions and grapes. Sangiovese plays a role, but so too do Malvasia and Gaglioppo. Tuscany shares almost equal weight with the wines from Lombardia and Trentino Alto-Adige. Some bold-face producers—Gaja, Aldo Conterno—make the cut, but so do edgier names, such as Ar Pe Pe and Paolo Bea. And two-and-a-half years in, Frank can report that what she’s doing is working: “We sell a lot of wine,” she says. All of which to say is that Ava Gene’s wine program has become successful—not in spite of a list that offers a more challenging experience, but because of it. Thanks in part to the intersection of a number of long-simmering trends, wine lists today look wildly different than those from 10 years ago. The Great Recession downsized bloated library-style wine cellars and ushered in an era of concise, pared-down lists. At the same time, importers and sommeliers have championed the value of underdog regions and grape varieties. 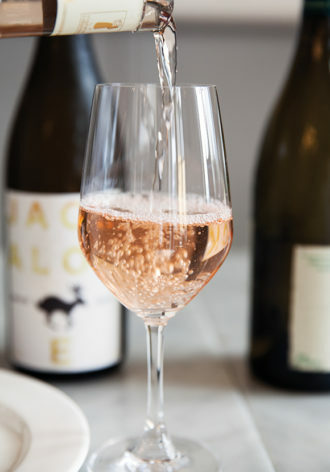 This has brought a kaleidoscopic swath of options to the market, the range of which diners have now come to expect—and seek out—when ordering wine. Food at the most fascinating restaurants has gotten bolder, with ambitious chefs more fearless in adopting flavors and techniques from around the world. That sometimes results in dishes that are less-obviously wine-friendly, but beverage directors are pushing for creative solutions, reaching deep into an arsenal of picks that go far beyond Chardonnay and Cabernet Sauvignon to wine’s outer orbits of sherry and fortified wines, as well as beer and spirits. In this shifting landscape, the most exciting wine lists are nimble, opinionated and function almost as an extension of the food menu rather than tacked on appendices. Size, for instance, was once a defining feature for the top wine lists—but today, it’s a much less important metric. Take the jewelbox of a list at Seattle’s The Walrus and The Carpenter: wine director Carrie Omegna keeps the list compact—between 60 and 75 bottles at any one time—but tightly focused on wines that go well with the seafood and vegetable-centric dishes on the menu. That means lots of high-acid, low-oak wines, such as a Allimant-Laugner Cremant d’Alsace Rosé NV and Domaine Branger Les Gras Moutons Muscadet 2010. Omegna feels that the edited selection of wines available at any one time helps reinforce the restaurant’s casual atmosphere. “When I go to a restaurant and they have a 20-page wine list, I don’t get very far in it,” she says. Keeping things unintimidating and light, even in the face of a more challenging and esoteric list, seems to be a touchstone of the modern wine-list experience—and this brand of approachable service softens the edge of an offbeat list. This hand-selling of analogue wines helps Frank push the wine conversation forward while still appeasing her customers; they get the flavor profile they want, while she keeps her high-concept list. Roberta’s embodies an of-the-moment, high-low balancing act that many contemporary beverage programs now perform. 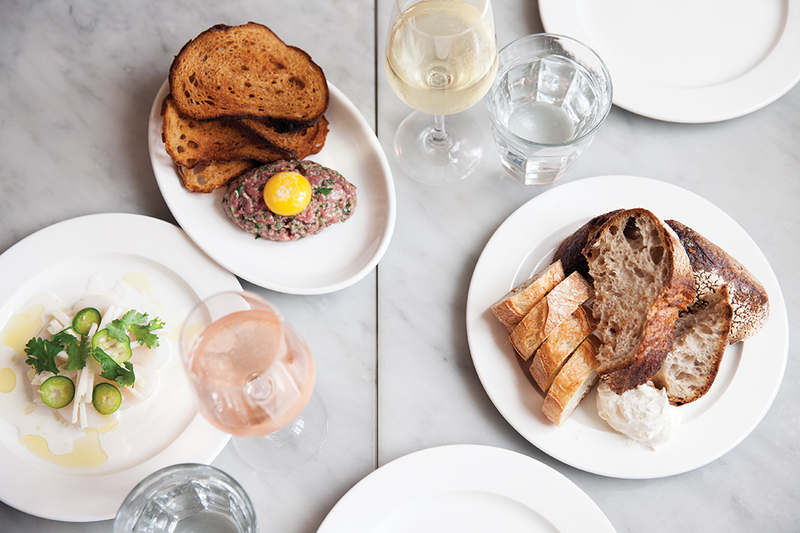 Tucked in the heart of Bushwick, a rapidly gentrify- ing industrial neighborhood in Brooklyn, the restaurant is both ramshackle (picnic bench– style seating) and sophisticated (the current chef de cuisine last worked at Manresa in California). The dishes range from rustic wood-fire cooked pizza to artfully plated dishes. And the wine list must codeswitch to all of these levels—ranging from casual drinkable fare to boundary-pushing bottles. As bottle selections on the list grow increasingly esoteric, many wine directors are exploring ways to encourage customers to try wines that might get overlooked. Theresa Paopao, sommelier of Ribelle in Boston, has found success in championing underdog wines by rewriting the rules for the by-the-glass list: each of her 10 nightly selections are listed only by a one-line tasting note. By eliminating technical pieces of information, she says customers are able to connect to the true flavors of the wine. She says the format allows her to “pour unusual, hard-to- pronounce or less fashionable wines,” such as a Central Coast Merlot and Australian Riesling she included on the opening by-the-glass list. At first, Paopao says customers were confused by the format and she fully expected people to gravitate toward the comfort of ordering known quantities off of the bottle list. But two years in, the program is thriving and the by-the-glass selections regularly top the number of cocktails ordered every night. 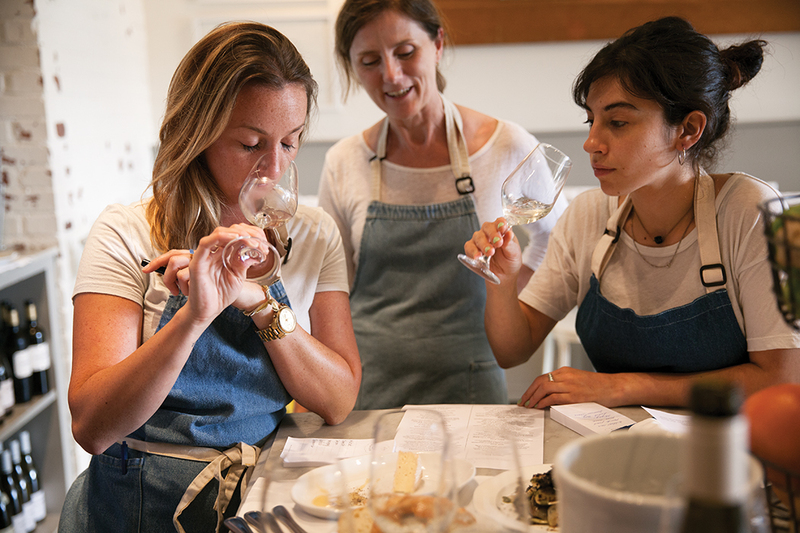 “Most people think it’s really fun,” she says, reporting that wine professionals are especially appreciative of the format because it gives them a chance to practice blind-tasting without asking the staff for a special favor. And, in a form of flattery, she says she now is starting to see similar description-based lists pop up on other menus. Formerly of Cambridge’s Oleana and New York’s Momofuku (she also opened Momofuku Toronto), Paopao says her confidence in creating a challenging list comes from working in restaurants where a certain level of trust between the customer and the chef existed. Carrie Omegna leads a staff training at The Walrus and the Carpenter. 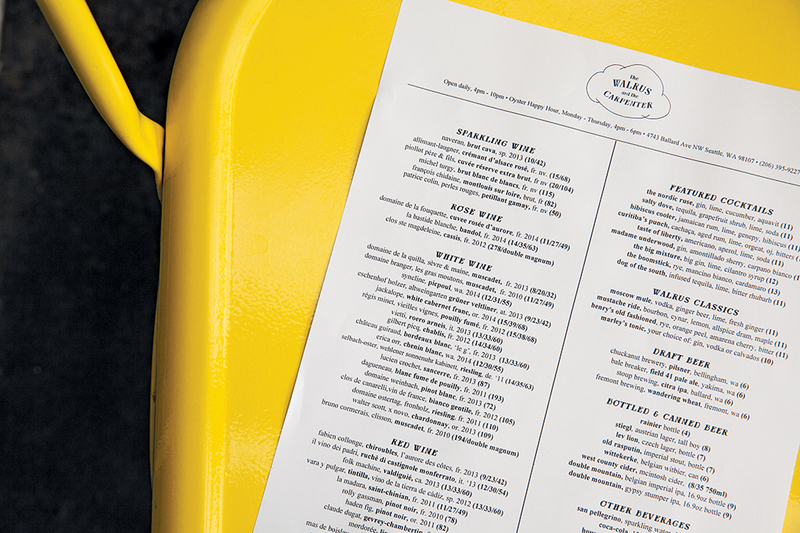 Opinionated wine lists can also help diners think differently about the food side of the menu, such as that of Fung Tu, a seasonal American-Chinese restaurant on the Lower East Side of Manhattan. When people hear “Chinese,” says beverage director and partner Jason Wagner, “a lot of people think cheap take-out or Szechuan.” But the menu at the almost two-year old restaurant, which earned two stars from the New York Times, is anything but, with clever remixes of familiar Chinese-American flavors such as masa scallion pancakes and fava bean curd terrine. Instead, he pivoted to a small list populated with whites that have a nutty or salty component, sherry, and natural wines fermented with indigenous yeast. “If I had a ton of Riesling, people would go in with the wrong expectations,” says Wagner, explaining that few of the dishes on the menu have that sort of mind-meltingly spicy component that call for an off-dry white. Having a list that has no Riesling helps patrons “think about what we’re doing in a different context,” he says. If Wagner has regrets about leaving the leather-bound wine binders of the fine-dining world behind, he disguises it well. Championing the low-overhead, high-turnover dynamic of his list, he says the ability to frequently tweak the list—usually twice a week—keeps both him and regular customers from getting bored. “I’ve had hundreds of different labels in the time that we’ve been open,” he says. Next on his goals for the program: getting a small roster of aged wines that he feels will complement the food. And this push for change and reinvention while staying grounded in a concept is part of what keeps customers coming back to the restaurant. In three months, both the food menu and the wine list will have been overhauled, Wagner says, but customers will place faith in the quality. Jennifer Fiedler is a wine and spirits writer and former editor at Wine Spectator. Her most recent book, The Essential Bar Book: An A-to-Z Guide to Spirits, Cocktails, and Wine, with 115 Recipes for the World's Greatest Drinks was published by Ten Speed Press in 2014. Subtlety is the name of the game in this cocktail from Employees Only.